(Nanowerk News) Georgia Institute of Technology researchers have demonstrated an optical metamaterial whose chiroptical properties in the nonlinear regime produce a significant spectral shift with power levels in the milliwatt range. The researchers recently demonstrated properties of their chiral metamaterial, in which they spectrally modified two absorptive resonances by incrementally exposing the material to power intensities beyond its linear optical regime. With a 15 milliwatt change in excitation power, they measured a 10-nanometer spectral shift in the material’s transmission resonances and a 14-degree polarization rotation. The researchers believe that may be the strongest nonlinear optical rotation ever reported for a chiral metamaterial, and is about a hundred thousand times larger than the current record measurement for this type of structure. The research, supported by the National Science Foundation and the Air Force Research Laboratory, was reported February 27 in the journal Nature Communications ("Intensity-dependent modulation of optically active signals in a chiral metamaterial"). This modulation of chiroptical responses from metamaterials by manipulating input power offers the potential for new types of active optics such as all-optical switching and light modulation. The technologies could have applications in such areas as data processing, sensing and communications. Chiral materials exhibit optical properties that differ depending on their opposing circular polarizations. The differences between these responses, which are created by the nanoscale patterning of absorptive materials, can be utilized to create large chiroptical resonances. To be useful in applications such as all-optical switching, these resonances would need to be induced by external tuning – such as variations in power input. “When you increase the power, you shift the spectrum,” Rodrigues said. 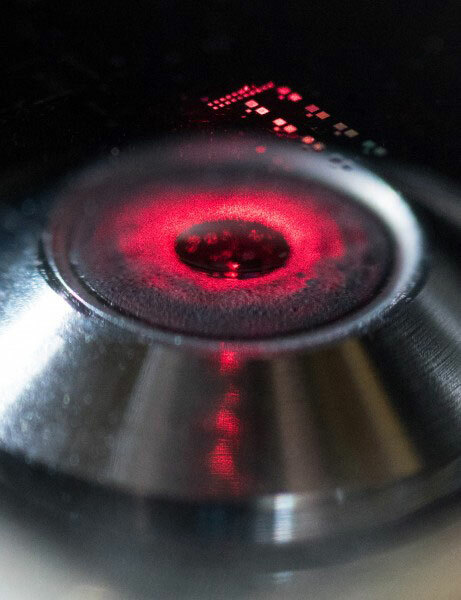 “In effect, you change the transmission at certain wavelengths, meaning you’re changing the amount of light passing through the sample by simply modifying input power.” For optical engineers, that could be the basis for a switch. The material demonstrated by Cai’s lab are made by nano-patterning layers of silver – approximately 33 nanometers thick – onto glass substrates. Between the carefully-designed silver layers is a 45-nanometer layer of dielectric material. An elliptical pattern is created using electron beam lithography, then the entire structure is encapsulated within a dielectric material to prevent oxidation. The material operates in the visible to near-infrared spectrum, at approximately 740 to 1,000 nanometers. The optical rotation and circular dichroism measurements were taken with the beam entering the material at a normal incident angle. The researchers induced the change in circular dichroism by increasing the optical power applied to the material from 0.5 milliwatts up to 15 milliwatts. While that is comparatively low power for a laser system, it has a high enough energy flux (energy transfer in time) to instigate change. The researchers don’t yet know what prompts the change, but suspect that thermal processes may be involved in altering the material’s properties to boost the circular dichroism. Tests show that the power applications do not damage the metamaterial. Cai’s laboratory has been studying chiral materials of different kinds for a variety of optical applications. In June 2015, they reported the realization of one of the long-standing theoretical predictions in nonlinear optical metamaterials: creation of a nonlinear material that has opposite refractive indices at the fundamental and harmonic frequencies of light. Such a material, which doesn’t exist naturally, had been predicted for nearly a decade.